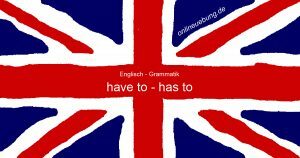 Englisch – Grammatik – have to – has to: sind modale Hilfsverben oder auch Modalverben. Do I have to go? Yes, I do. No, I don’t. Do you have to go? Yes, you do. No, you don’t. Does he / she / it have to go? Yes, he does. No, he doesn’t. Do we have to go? Yes, we do. No, we don’t. Do they have to go? Yes, they do. No, they don’t.